Astral People & Handsome Tours are pleased to announce the Australian headline debut of North London singer, musician and artist, Ama Lou. Ama Lou will bring her live show to Sydney for the very first time, for a special performance at Red Rattler on Thurday 13 December. Authentic, natural, soulful, Ama Lou has already gracefully established herself as a rising star with just a handful of songs. Having received co-signs from artists such as Drake and Jorja Smith, Ama Lou is poised for a global takeover. The classically-trained 20 year old has already come a long distance a short amount of time. Having established herself with just a handful of songs, Ama Lou's artistry has culminated in in her most recent effort, DDD - a three-part film and EP directed and co-produced by herself. Earning nods from a wide variety of outlets such as Complex, Clash and The FADER, DDD has firmly cemented Ama Lou as a force to be reckoned with. Ama Lou's self-directed video treatment for DDD takes the music to a completely different place, exhibiting a cohesion that come only come from writing the songs and visual element in tandem. As a DIY artists, she writes and produces her music (often with collaboraters), and creates all her own visuals and films with her sister Mahalia. DDD is no exception as it takes the songs from the EP and contextualises them in a cinematic universe. With articles and features in The FADER, Pigeons & Planes, Vogue, and many more, Ama Lou is in high demand. 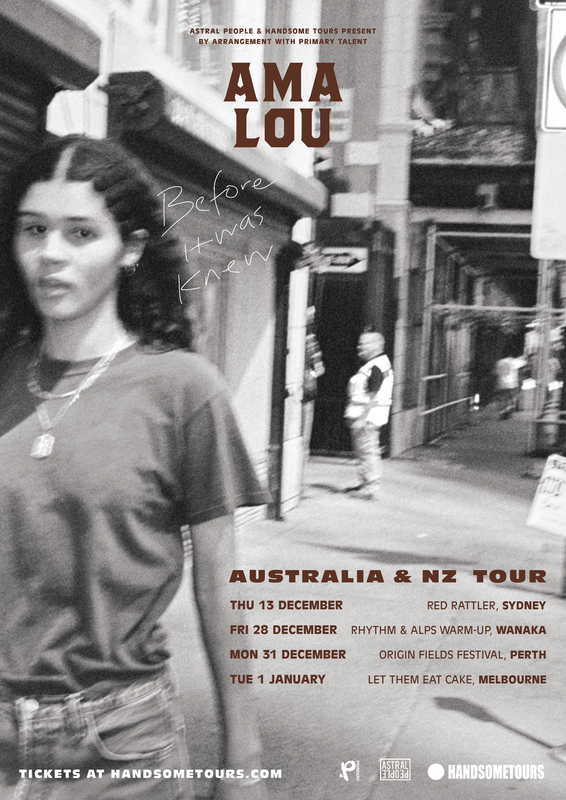 Having just finished touring the US with Jorja Smith, Ama Lou is now bringing her distinctive sound and unique style to her own headline show in Sydney, Australia. Ama Lou's debut Australian headline performance promises to be an intimate, one-off experience, not to be missed.